Right, you’ve had your say and you’ve delivered a decisive enough result. Voting is now closed on the poll for our Player of the League for 2018 and the winner, with 40% of the votes cast, is Eoin O’Donoghue. Very well done to him. The young Belmullet defender certainly grabbed the bull by the horns in this year’s NFL campaign. Handed his first full competitive debut in the opening round up in Clones, he put in an assured display that day against Monaghan, tackling hard at the back and getting involved in the action up the field. He capped his display in that game with a second half point, which, on a day of very fine margins, contributed to our getting over the line by just a single score. He was also on the scoresheet in Round 7 against Donegal. As we hunted frantically for the late, late scores we needed to retain our Division One status for next year, Eoin was coolness personified when he surged forward up the right flank and shot over from distance. Eoin was one of a handful of players who were ever-present for us in this year’s League campaign – so too were Aidan O’Shea and Kevin McLoughlin, who came second and third respectively in the poll – and he now looks set to make his championship debut for the county this summer. More power to him. Here’s how the voting finished up. Eoin O’Donoghue had a brilliant league. Glad to see he got his chance this year. He showed he is a brilliant man marking corner back but also showed he can contribute at the other end of the pitch aswell. Very confident player. Hopefully he’ll get the nod to start against galway. Very well done to him. Was given a chance to shine and took it. Steady performer the whole way through and now looks set to challenge for a starting berth in May. Himself, Loftus and Coen are all beginning to add something now. Congratulations to Eoin O Donoghue, he is truly a great addition to the panel and he should be one of the first names on the team sheet from now on.Of course he has big shoes to fill and I for one am not going to suggest who should make way for him. I read on the Western People that he has scored more from play than some of our more vaunted forwards. Connor Loftus is really showing that he can take on the responsibility of free taking in Cillians absence and in the future he should share this task with Cilliain, anyone can have an off day. Connor has great vision and his foot passing is top drawer, he is a natural footballer and has a talent that could not be coached. Fergal Boland is another one if given enough game time will definitely make the grade. Anyone at the Mitchels v Breaffy game? How did Ruane get on? Did Hanley/Akram play for Ballagh? Treacy for Ballina? Well done Eoin Feel he has a good chance of starting v Galway. Doubt if any of the other young fellas will start though Loftus has a slight chance Reckon it will be the old dog for the hard road on May 13 presuming most of the old dogs are fit for action. We will have our hands full that day and need to start well so as to make Galway come out and play. The more open the game the better. They have some very good young lads but I think there will be a lot of pressure on them. Well done to Eoin, keep up the great work! Well done Eoin. I’ve said before a large influx of new players is not required, its far more uselfull to get one or two in every year for a more seamless transition. We’ve added Durcan, harrison and now hopefully O’Donuhoe recent to the back. Been short up front with only really diarmuid coming in but I really hope loftus can put for a starting place this year. Midfield is a worry going forward tho. I hope Eoin gets a start against Galway. I was at the Mitchell’s vs Breaffy match. Great game of football. From a county point of view, the standout player was James Durcan, scored 1-5 from play. I hear he is in the development squad but having watched him over the last 9 months he should be very close to the match day panel. He has his brother’s pace and his finishing seems to be improving all the time. For Breaffy, Conor O’Shea was best I thought, 0-3 from play. Hennelly got 2 very good long range frees/45s. Mitchells look very strong and that was without Barry Moran and Vaughan. Welcome back Keith Higgins, I’d like to see him in the half forwards, he has blinding pace and he would open up Galway backs I would say the same for Paddy Durkan we have plenty of cover for the backs, so any of those two would worry any defence as they are quite capable of taking scores. As Willie Joe has said.. the scores taken by Eoin were crucial to our continued participation in Division 1and for that reason alone he is well deserving of this recognition. Maith an buachaill. Interesting timing that Keith is back in that if Eoin gets the nod at corner back for championship then that would free up Keith to a more advanced position. Could be hugely important for us if this adjustment were to work.. if not then we have more strength in depth in defence. I wouldn’t be sure about Eoin nailing a starting place. He’s a mighty fine footballer, loads of confidence and combatative but not sure he’s tight enough for corner back. Crowe looks tighter and is taller. I would seriously consider Keith in half forwards as a sweeper / runner with Diarmaid or Jason under most pressure to lose out. If Conor L does come in then it has to be at Cillian’s expense and that decision may be made for Galway game anyway as Cillian will be not long back or possibly borderline championship fitness wise for it. For all Diarmaid’s workrate not sure all the runs are the clever ones. Keith seems more potent especially on the front foot and possessing a range of passing skills, Diarmaid is however one of our more reliable long range shooters. Boland will probably be unlucky game time wise again this summer. The other place we could put Keith is half backs as replacement for Leroy. Does anyone else agree with me? I’m always harping on about James Durcan since I saw him help destroy Crokes in that club semi a few years ago. Thought he was very good in the county final before his black card. That pace has to be harnessed and I’m slightly puzzled that Rochy hasn’t tried him this year, but no doubt he’ll be reading this post avidly and will shortly be on the blower to Donie and Tony. Sad to hear of the young Garda from Moycullen who died unexpectedly in Clifden. Had served in stations in Galway and Mayo and guessing also may be a colleague of Colm Boyle. Shuffly Deck, you said exactly what I was thinking as I stood on the terrace in Ballybofey at HT, O’Donoughue was far too loose on a couple if occasions. I had noted it along with a few other things but didn’t bother saying it/posting it as didn’t want to seem harsh for a young buck who showed guts maturity and no shortage of ability when kicking thst crucial point. A bit tighter Eoin. Learn from the school of Harrison and Keegan and you’ll do just fine. @ Grainne Uaile MCDonald in my mind was the greatest ever to play for Mayo.had everything. 1-5 from play is serious scoring from James Durcan. I couldn’t understand why he wasn’t on the FBD panel earlier this year. We could badly do with a pacy inside forward who can take on his man. Brian Gallagher has slotted back into the Claremorris team with ease, scored 1-2 at the weekend. We’ll done to Eoin O’Donoghue – a great ‘find from the league and looks like he has all the tools to have a fine intercounty career and please God he’ll make his mark on the championship as well. I personally voted for Kevin McLoughlin but I wasn’t a bit surprised when Eoin won the vote – he was especially very good in weighing in with a few scores when we needed them. Great also to see Keith Higgins back in the fold – we need everyone we can get now with Leeroy out of the picture. Just the mention of c Macdonald above. Was chatting in pub over the weekend, and if there was one player you could add to the current mayo team who would it be. One mayo man and as an alternative one from any other county. Mine were Ciaran mac from Mayo and from outside paddy mcbreatty. Any era considered. Any thoughts. Why has been James Durcan been ignored by Rochford.is it his size? He is as big as Douglas , Regan and Loftus. Brian Gallagher ,Jack Reilly and Matty Ruane are all other players standing out for there clubs at thw moment. Shoutout to the Western People for there excellent coverage of the Hogan Cup final for Rice College and there pieces on the Colmans 77 and Geralds 97 teams and also the Mayo connection with St Jarlaths great reading and all there other local Gaa coverage.Wishing Geralds and Nathys all the best Saturday!! Sorry I meant Rice college let every Westport ,Kilmeena and Burrishoole man and from all surrounding areas head to Croker Saturday days like these don’t come to often!! Ciaran Mc is certainly the best baller I’ve ever seen playing for Mayo that’s for sure but he didn’t score enough in big games such as all ireland finals but that point against Dublin in 06 will live long in the memory imagine what he or Kevin O’Neill in their prime would add to this Mayo team. The second best player I’ve ever seen playing for me has to be Cora Staunton. If Cora was male we would have several Sam’s in the bag at this stage. I think for the chip KMcL should play as sweeper with KH playing in the half forwards to add some pace there. We do need to mix things up in the forwards. Why? An over reliance on AM! The Dubs will tell you ‘stop Moran and you stop Mayo’! That’s one of our key weaknesses heading into the chip. Unfortunately he’s still our main scorer from play and of course the opposition know it coz they often double mark him. It was disappointing that we didn’t find an athletic young midfielder in the league. Whilst the likes of SC and DoC have been mentioned as alternatives they’re not really specialist midfielders. Could Cian Hanley fill the midfield gap? Btw, I think Loftus deserves to start over DoC against Galway. He has good passing range from half forwards whereas it’s difficult to see what value DoC currently brings to the team. It’s a pity to say it but his form is fairly indifferent of late and others now deserve their chance. I hear people saying Diarmuid should lose out or that Loftus should come in at Cillian’s expense. Diarmuid wins quite a lot of ball and you can’t really judge Loftus on one or two good games. Cillian’s captain and won’t lose out unless unfit just for the Galway game. The reality is none of the two lads will lose out if both are fit. The player I’d be worried about losing out is Jason, hasn’t really found his form in the league. Anybody know anything of the Connacht Minor [U17] League this year? Was it played? Never heard a mention of it and as usual cannot get any info on the Connacht GAA website. I understand the the championship in this grade is to be played on a round robin basis. James Durcan scored 1-5 from play, was fouled for two converted frees and had another goal chance saved. Visibly he has gained a fair bit of muscle. This was against a good Breaffy side. We really need to be thinking of bolting James Durcan forward based on that. We know that we lack pace if we compare to Dublin, Kerry and Galway. He’s a player who has been playing the top level of Senior club for a few years. Danny Kirby who is involved in the panel was scoreless in the same game. Diarmuid is absolutely killing himself off the ball. His running and workrate are insane. Martin Carney mentioned this on the blog and I’d be inclined to agree. He’s covering every blade of grass and therefore is too tired or out of position to make a difference in attack. I’m not sure it’s an issue with form, I think he’s been asked to do a job or else he’s trying to do too much. 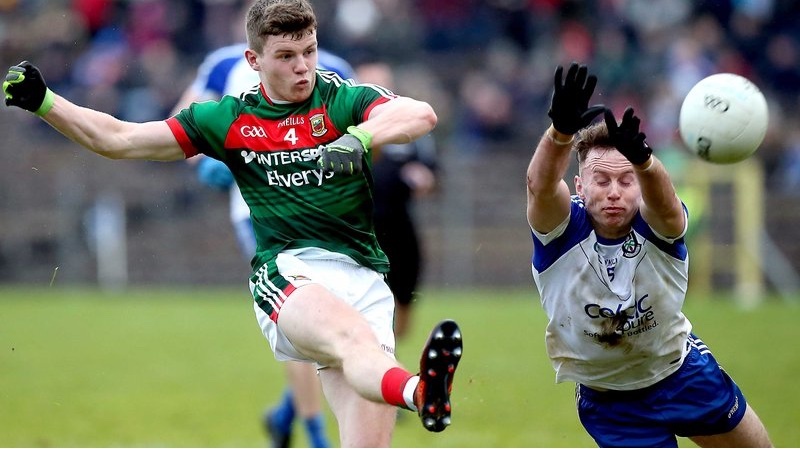 James Durcan is a fine player and looks to be improving, im sure he will be pushing for a Mayo call up next year. Bit lets put it in a little context, it was a Mayo league game. I think its a little harsh saying Rochford is ignoring him or any other player, im sure Stephen is looking and is well aware of potential talent in the county. Fact is there are very few places available on the panel, Stephen is not building for the future, he is preparing for this year only. We have plenty of options at hf, DOC, Loftus, KMc, AOS, COS, Jason, Boland, if Leeroy and Barrett were fully fit I would expect Paddy Durcan to pop up at hf, even Keith as some suggested, Cian Hanley will be there purely beacuse he has years of professional training under the belt, he will be ready to go when the time comes. James maybe looking good but the slot isnt there for him yet. Regarding the positioning of Keith, as ive listed above we are not short of options at hf, Keiths strength is breaking with speed from deep, I dont think he would be as effective further up the field. With our issues at fb I could see a back line of ODonaghue, Harrison and Keith. Probably the best available if all fit. @Mayomessi, I don’t think it is Rochford ignoring him. He was probably on a specific plan to bulk up with much gym work and he is part of the Mayo development panel. I would say it is his extra power that is now allowing him push past the first tackler easier. That is getting him into clear space and then he has the pace to push on and score. Being Paddys twin, closer to Paddys strength now and for sure being a more natural forward I think he is going to have a big summer. He is far more suited to Croke park than some of our forward options who simply lack pace. It is at full forward line we’re lacking. Cillian has class but simply not able to scorch lads which makes a lot more chances. Neil Douglas has similar class but not able to either. Andy quick over 10 yards and the cuteness of his runs buys him space. Jason wins more ball inside than either but he’s also our 2nd best forager around the middle after Kevin Mc. Diarmaid puts in a huge workrate but the downside is he’s not really hurting teams on the scoreboard even though he’s probably our best long range shooter. Martin Carney was right about needing more clever running. Maybe it is coming from management but if Kevin Mc is sweeper and Diarmaid instructed to run all day then we need plenty of scores from no 11 who is AOS. He was free scoring from distance as a minor but has lost that skill maybe because of the reduced space but maybe like Diarmaid because of high workrate needed. IMO because of our restriction of attributes, players should be totally interchangeable. Fast half backs and half forwards continue into the corner forward position, and sharp shooting corner forwards (who struggle to win ball) coming round on the loop. Those on the loop scores we are still so far off where we need to be. Dublin are the benchmark and they are using that on the loop score as one of their bread and butter scores. Players coming in off the wing receiving a layback handpass 25-30 yards from goal and shooting quickly. In simple logic Dublin are shooting much closer to goal. They have it well thought out the two and three passes and runs that need to happen before the shot to setup these simpler chances. Could we convert Eoin into a forward, after all, he did seem to have the confidence and a cool head when scoring that magnificent point when chances were thin on the ground.